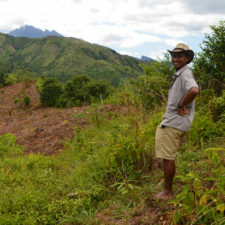 Sam Roberts is a Coordinator with the Azafady Conservation Program in Madagascar. Sam graduated with a Bachelor’s degree in Zoology as well as a Masters degree in Ecology after studying at Bangor University in North Wales. Sam has been working in conservation for over a decade in places all around the world. Sam considers himself an aspiring evolutionary biologist and conservationist with a diverse array of taxonomic interests, and has never thought about working anywhere but Madagascar (since arriving in the country) due to the clear need for conservation in the country. Sam he can be contacted via email at: samhyderoberts@gmail.com or sam.roberts@azafady.org. Lemurs are a fascinating group of primates, and I suppose have been lurking in my subconscious since my early encounters with them both at Zoo’s and, like so many people, on early David Attenborough BBC television programs. Besides from their now obvious and seemingly ineluctable conservation needs, they possess a certain ethereal quiddity which made them difficult for me to forget. Later, during my university education, lemurs became a much larger and exigent dot on my radar. As I became an ever more passionate wildlife biologist and conservationist, it was only a matter of time before my attention was drawn to Madagascar and its imperiled wildlife. Then, in 2012, I took a research position in the northwest of the country and I am now heading into my third year working in conservation in this incredible country. Sam is in the middle of the canoe in the green shirt! Photo courtesy of Sam Roberts. Currently I coordinate the research conducted by Azafady in the highly fragmented littoral forests of Sainte Luce, in the southeast of the country. We currently conduct an extremely diverse array of projects, though the local lemur populations are a definite focal point of our work. Unfortunately, the lemurs (there are four species in Sainte Luce – Eulemur collaris, Cheirogaleus medius, Avahi meriondalis and a Microcebus sp.) here face an uncertain future, and suffer the burden of a multitude of threats and challenges. Only two of the 17 forest fragments now support the collared brown lemurs, whilst others currently sustain disparate communities of nocturnal species. A combination of hunting and rapid habitat loss has led to the steep decline in lemur biodiversity in the area, with the local extirpation of the bamboo lemur (Hapalemur griseus). This decline has occurred over the past 15 years and is a dramatic example of the urgency for practical conservation initiatives. With two forest fragments recently earmarked for protection, progress is slowly being made yet there are major obstacles to overcome in the coming years. Our most ambitious and large scale lemur project has been running now for almost five years and will be completed this October. 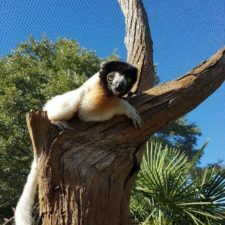 The aim of this project was to determine the population size of each of the remaining lemur species within the now protected fragments and establish whether or not these populations are viable with regard to long-term survival. Armed with this knowledge we then hope to be in a position to develop appropriate management strategies to safeguard this species long in to the future. 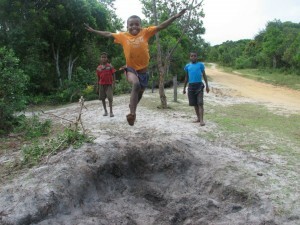 What is a typical day like for you working in Madagascar? 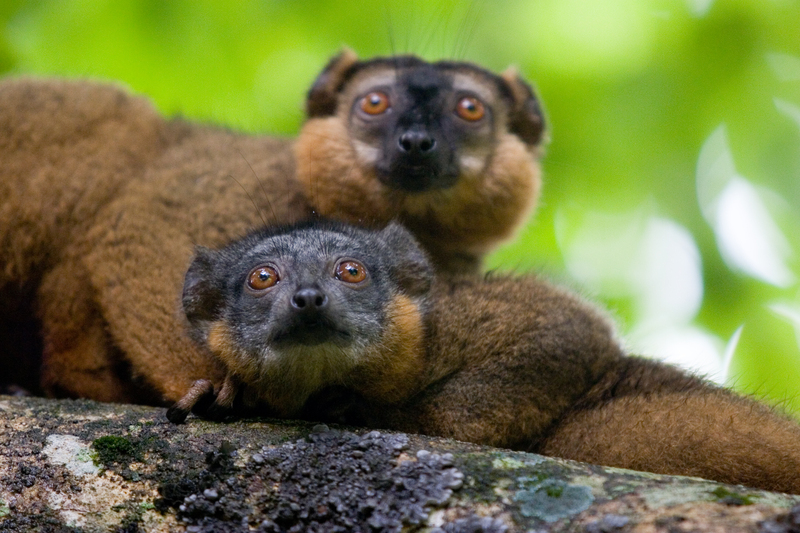 Collared brown lemur (Eulemur collaris). A typical day for me invariably begins with a cup or two of extra strength Malagasy coffee before briefing the team and heading out into the forest. Usually I start the day with an early morning bird survey before beginning work on one of our other established projects. These bird surveys provide me with an invaluable form of relaxation first thing in the morning, and listening to the sounds of the forest never fails to inspire. An average day involves at least four or five ecological surveys, which range from monitoring the collared brown lemur diet as it changes with the season to the DNA sampling of the herpetological community. Our work really is varied, but each project is designed to answer a specific conservation question with the end goal of publication in a respected research journal. Needless to say each working day is both physically and mentally demanding, often in sultry conditions, with surveys invariably requiring a lot of walking and mental concentration. Very rarely does any of the team have trouble sleeping, unless of course the local amphibians decide it is their night. 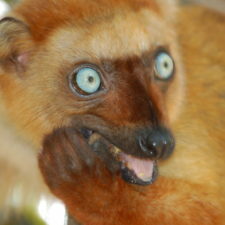 Undoubtedly the hardest challenge for me working in lemur conservation is to maintain a consistent, sanguine attitude. Seemingly every article or journal you come across highlights another challenge or another cause for woe. However, these ultimately only serve to reinforce the zeal which drives dedicated conservationists on, working hard to ensure that invaluable creatures like lemurs continue to have a place in the world. It can be very disheartening at times to read of the ubiquitous declines, not just of lemurs but in almost all Malagasy wildlife, as forests nationwide continue to shrink. There are antidotes to this however and reading about the trials, experiences, and successes of contemporary conservationists working around the country gives ample cause for optimism and provides reassurances that all the hard work is worthwhile. Children playing at one of the locations in which Azafady works. The lemurs of Sainte Luce face a similar array of threats to other lemurs I have worked with elsewhere; with the direst threat coming primarily via the destruction of natural habitat, but equally as insidious is the threat faced from hunting and for bushmeat. Compounding these issues further, the less immediate threats from habitat fragmentation such as inbreeding depression and genetic bottlenecking all combine to cast a serious shadow over the future of wild lemurs in Sainte Luce. A further threat also stems from the locally infrequent capture of wild individual lemurs for the repurposing as domestic pets. 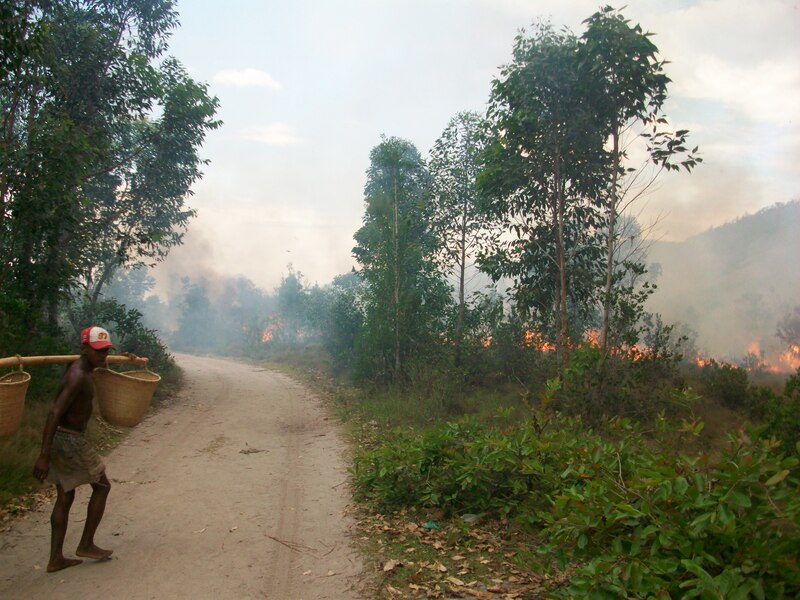 Community education can help to reduce and even perhaps eliminate some of these threats in time, but the most immediate and large problems must be tackled by strong community leadership and a determined approach to arresting the exploitation of local forests and developing a serious approach to preserving wildlife. 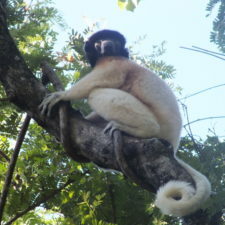 Bush fires represent a threat to lemurs in many areas in Madagascar. Once, during my first few months managing a conservation program on Nosy Be (and island in the northwest of the country), the team and I thought it may be productive to try and get a better understanding of the cathemeral habits of the black lemur, and set out to observe a semi habituated group for a continuous period of 24 hours. Working in shifts, and in groups of two, we made up a rota and began observing the group, being careful not to introduce any noise or disturbance which may affect the natural behavior of the lemurs. Watching a group of inactive lemurs can be a test of one’s patience at any time of the day, as they huddle together motionless high in the canopy; however at night, relying solely on moonlight to make observations, things become far more challenging. As I arrived at the site of the lemur group at 3.00am to relieve my diligent colleagues, I found not only the lemurs, still motionless and enjoying a deep sleep, but also my research team – flat out at the bottom of a tall mango tree! Looking back on this endeavor, it now seems foolish to have undertaken such an errand, but it was a valuable lesson in research planning and researcher limitations! Interested in volunteering with Sam’s employer? Check out these volunteer opportunities with Azafady!